Some HTC One owners in Europe have a new version of Android to explore this weekend, after the latest 4.2.2 version of Jelly Bean started to arrive on handsets across the region. Some users of the 4G iteration of the device began seeing the update late on Friday, which brings the Android Daydream wallpaper, quick settings options and access to lock screen widgets. However, beyond the standard Android 4.2.2 update, which also includes the ability to access Google Now by swiping up from the home key, HTC has also taken the opportunity to boost HTC Sense. It brings Instagram to Blinkfeed, adds a battery percentage indicator and gets rid of the unsightly black menu bar that popped up when using some Android apps. The update is available to download over the air and users can check its availability by navigating to Settings > About > Software updates. As always with these deals, it may take a little while for the update to reach all users so if you haven't had a notification yet, don't fret too much. There's also no indication of when One owners in the US may be getting the update, but we can't imagine it'll be too long. The good folks at AndroidCentral have gone hands-on with the update so at least you can see what's in store when the new software lands on your device. 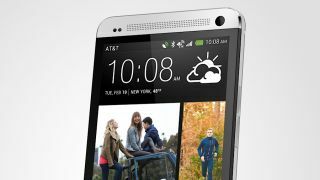 Is HTC plotting to launch a version of the One handset rocking Windows Phone 8?